Fishermen’s News Online Jan 20, 2019. 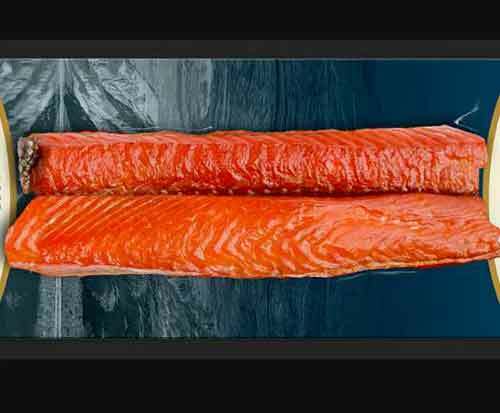 Ocean Beauty Seafoods’ Echo Falls brand has introduced three new smoked salmon treats, including Applewood Smoked Wild Alaska Sockeye Salmon Candy, sustainable strips cut from whole fillets of Bristol Bay salmon. The strips are cured in brown sugar and salt, then slowly smoked in Applewood. Also new to Ocean Beauty’s portfolio of smoke products are Beechwood Smoked Norwegian Atlantic Salmon and Whisky Cask Smoked Scottish Atlantic Salmon. The Beechwood smoked salmon is dry cured using only salt and slowly smoked with native beechwood, then packaged in a fiber sleeve that illustrates the beautiful waters of Norway. The Whiskey Cask Scottish salmon, by comparison, is a marriage of fresh Scottish salmon dry cured and smoked in Scotland over spent whisky casks. These new products, according to Ocean Beauty Vice President Ron Christenson, were introduced as part of the company’s constant outlook for new, innovative flavors and methods of preparation to offer customers unique flavors from top seafood regions. All three are available in grocery stores nationwide in four-ounce packages. The Applewood Smoked Sockeye Salmon Candy is also available in 12-ounce packages and the Whisky Cask Smoked Scottish Atlantic Salmon can be found in seven-and 12-ounce packages too. Fifty percent of the wholesale profits are being invested back into the communities of Bristol Bay in Southwest Alaska. Ocean Beauty is an Alaska corporation with five shoreside plants in Alaska, value added processing in Washington State, seven distribution facilities in the western US and sales offices in Seattle and Tokyo.